Bratislava certainly lives up to its title as the Little Big City. Wandering around the compact centre it feels more like you’re in a small market town rather than Slovakia’s Capital City. 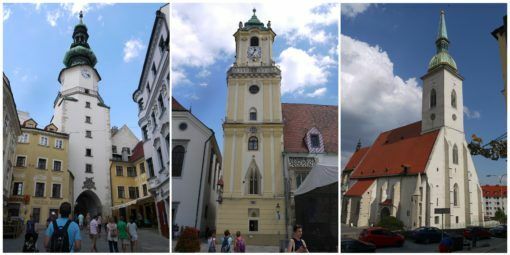 Still, we found lots to like while visiting Bratislava, from castles and churches to palaces and clock towers. Bratislava was just the quiet tonic we needed after a week of hard-core sightseeing in bustling Budapest. 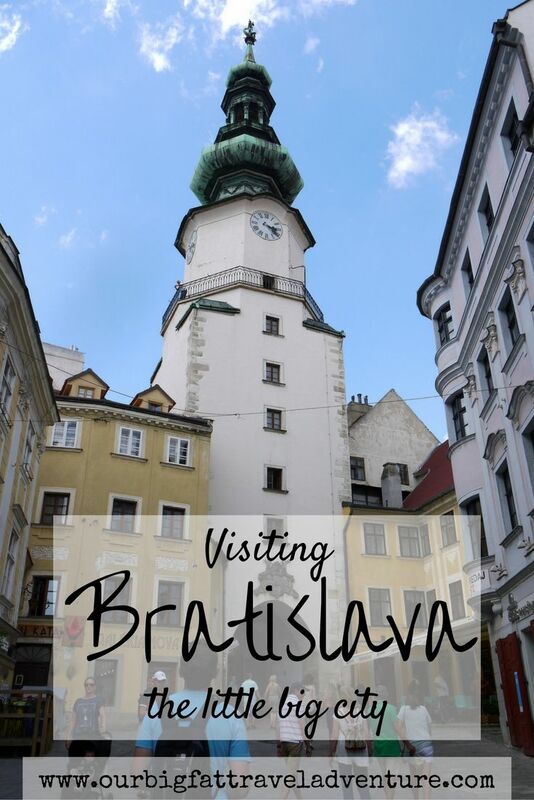 Almost all of the Bratislava attractions we visited were based within walking distance of each other and we covered them in a couple of days, leaving time for a day trip to Vienna in Austria. We enjoyed the slower pace and liked being able to linger over street-side meals, hang out in the squares and just soak in the old-world atmosphere of the city. We loved the colourful buildings and quiet squares, walks by the river and photographing all the grand buildings. Here’s what we got up to while visiting Bratislava. This pristine white castle sits on a rocky hill above the city. The building was reconstructed in 1968 after decades of ruin following a fire in the 1800s. Inside, parts of the castle house the Slovak National Museum, which costs €6 to visit. Gardens surrounding the castle overlook the red roofs of the Old Town and the thick ribbon of the Danube River, giving amazing views. 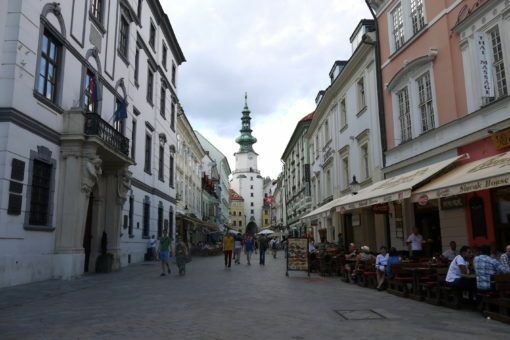 We thought Michael’s Gate was the most picturesque area of Bratislava. It’s one of the main entrances to the Old Town and Michalska Street, which is filled with cafes and bars, leads all the way down to the Danube. We ate many of our meals and sampled different flavours of lemonade here, in one of the liveliest areas of the city. 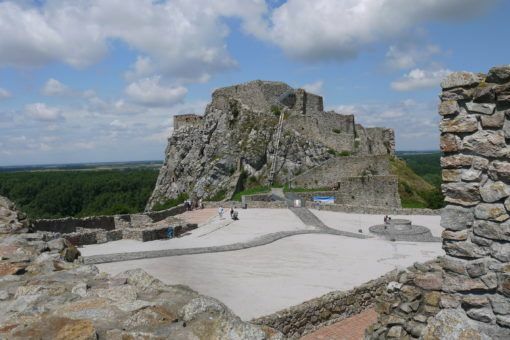 This ruinous castle was my favourite stop in Bratislava, reminiscent of the incredible castles we saw in Scotland. To get to Devin Castle we had to take a number 28 bus 20 minutes outside of the city and scale the grassy cliff-top which the castle is perched upon. We paid €4 each to enter the castle and followed trails past ruins of chapels and tombs. We were surrounded by vivid green countryside, goats, sheep and sweeping views. From the top of the hill we were able to look over the river across to Austria. Outside the main part of the castle there were displays of medieval artefacts and a chance to have a go at some archery. 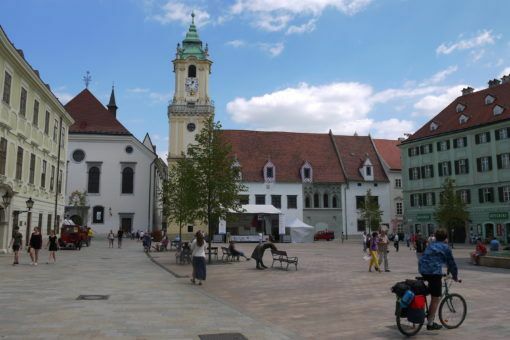 It doesn’t take long to stroll from one square to the next in Bratislava; each is surrounded by colourful buildings and cafes and is decorated with fountains and statues. 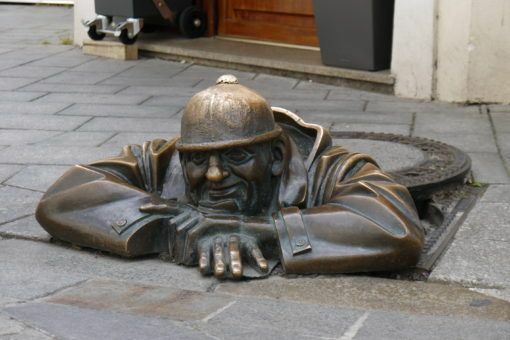 Whilst wandering around you’ll spot some quirky statues in the city, our favourite was the ‘Man at Work’ poking out of the ground. This is actually a complex of buildings housing the Bratislava City Museum, which you can visit for €6. The Town Hall is one of the oldest stone buildings in Slovakia and one of the most beautiful features of the main square. We paid a couple of euros each to walk up the clock tower; from there we got an amazing aerial view over Bratislava, including the main square and the castle. 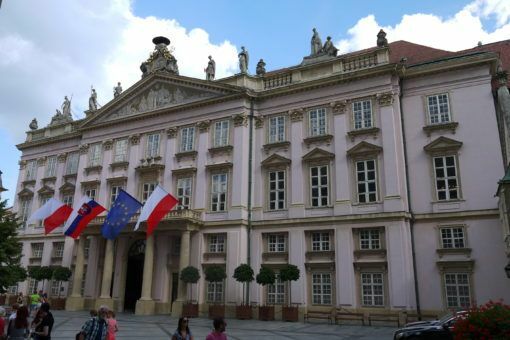 The Primate’s Palace is a striking 18th Century, pink-and-white building which sits in Primate Square, next to the Town Hall. The building is used for council meetings and is the seat of the Mayor, but you can also tour grand rooms filled with tapestries, paintings and statues for €3. There’s also a pretty courtyard with a fountain to discover. 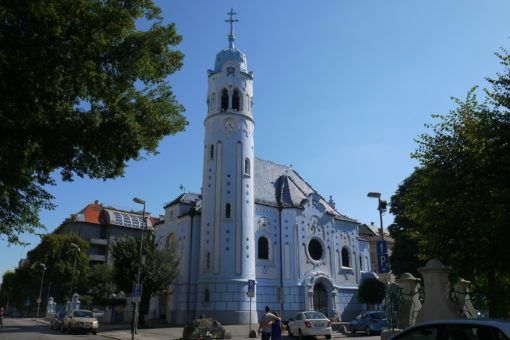 Formally known as the Church of St Elizabeth, the Blue Church is one of the most unusual, art nouveau buildings in Bratislava. It reminded me of a mosque with its mosaics, gold trim and glazed roof; as well as some of the Gaudi buildings we saw in Barcelona. The inside of the church was closed, however we caught a glimpse of the interior, which is also pale blue and gold, through the gates. 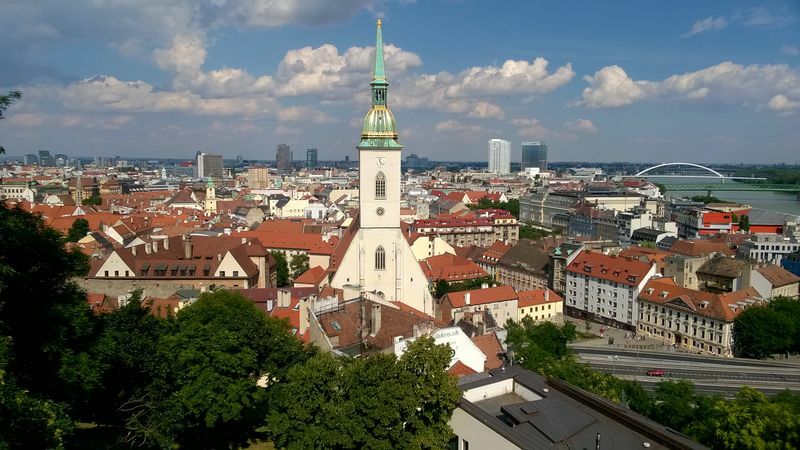 St Martin’s is the largest cathedral in Bratislava; the spire is 85m high and can be seen from miles away. You can venture inside the building for a couple of euros and look around the surrounding area, where you’ll find narrow streets filled with colourful houses and the city walls, which you can walk along. 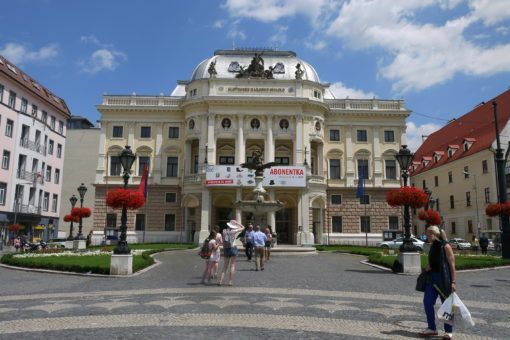 This is one of the oldest theatres in Slovakia, set in one of the most beautiful parts of the city: Hviezdoslav’s Square. We loved wandering along the tree-lined street, past coffee shops and fountains down to the river. Check out this vlog about our time visiting Bratislava; you can subscribe to our YouTube channel to follow all our travel videos. 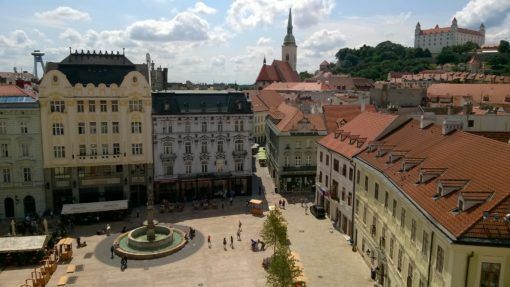 We used Airbnb to find cheap accommodation in Bratislava. 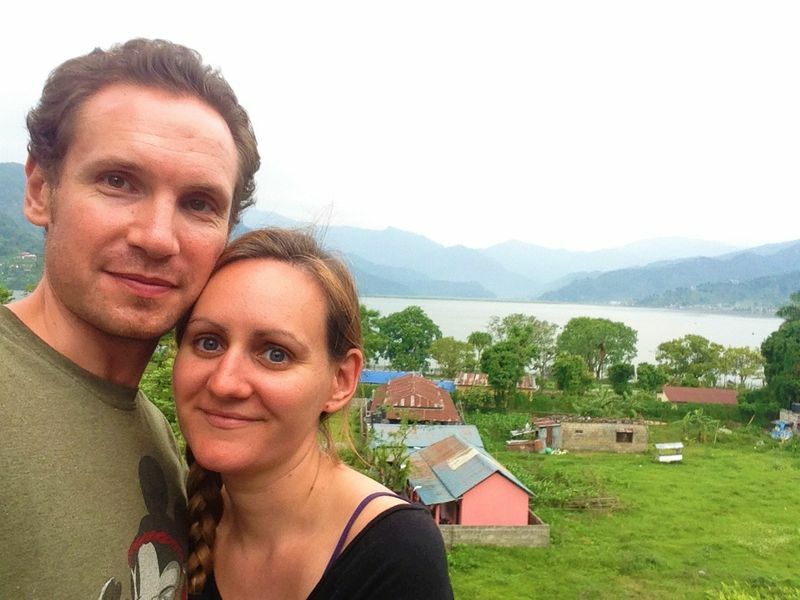 Our shared house was twenty minutes bus ride from the Old Town and cost just £15.30 per night. If you’ve never used Airbnb before, you can get £20 free credit to spend on the site if you sign up using this link. The next stop on our Eastern European road trip was Prague, my favourite city of the year. 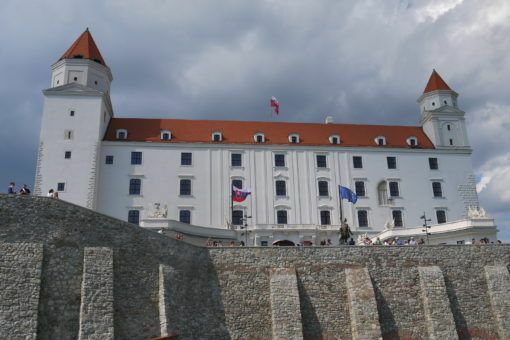 We also went to Bratislava this summer, and I hadn’t been for many many years! ‘Glad that people are spending a little bit more time there lol! 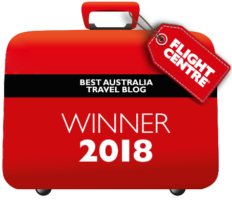 Hi Victoria, I definitely think we could have booked in less time for Bratislava but in the end we were glad to have some quiet time in between hectic trips to Budapest and Prague! We also loved having the unexpected opportunity to take a day trip to Vienna from Bratislava! What did you think of Vienna vs Bratislava? I have time for two days in either this December, and I’m having a hard time choosing!